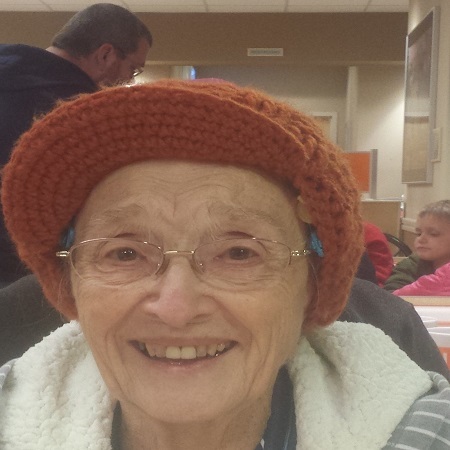 Willie Mae Stuckey, 89, of Whitesboro, Texas entered into her heavenly home on Thursday, April 11, 2019 in Athens, Texas. Willie Mae was born on January 30, 1930 in Dexter, Texas to Jim Frank and Gladys (Randall) Parker. She married Billy Stuckey on her birthday in 1948. Together they raised their two sons, Ray Lynn and Danny. They were married 52 years prior to his passing in 2000. She then married Wesley Osborne and they were married until his passing in 2004. Willie Mae loved sewing and gardening but her greatest love was her family and taking care of others. She was the most loving woman and had the most beautiful smile on her face at all times. She is survived by her son, Ray Lynn Stuckey and wife, River of Whitesboro, son, Danny Roy Stuckey and his wife, Cindy of Mabank, step-daughter Janine Norman, step-daughter, Jonna Osborne, step-son Jerry Osborne, seven grandchildren, Brent Stuckey, Tara McCreight, Sarah Wiggins, Bleys Stuckey, Lance Fox, Billy Stuckey, and David Stuckey, seven great-grandchild and one great-great-grandchild as well as a host of nieces, nephews, cousins and other loving family members. Willie Mae was preceded in death by her parents, Jim and Gladys Parker, husband, Bill Stuckey, husband, Wesley Osborne, granddaughter, Becky Stuckey, siblings, Linnie Parker Roberts, Lucille Parker Hill, Austin Parker, Fred Parker, and Aubrey Parker. Pallbearers will be David Stuckey, Brent Stuckey, Bleys Stuckey, Lance Fox, Brad Wiggins and Ronnie Stuckey. Funeral services for Willie Mae will be held at 10:00 AM on Saturday April 13, 2019 at Meador Funeral Home of Whitesboro, officiated by Rev. Rick Carney and Ray Lynn Stuckey. Interment will follow at Oakwood Cemetery in Whitesboro. No formal visitation is scheduled. I am so very sorry for the passing of this precious lady!!! She was always so very sweet when I talked to her. Ray Lynn I will be praying for you and your loved ones! Prayers of peace and comfort for all of you. I will certainly miss her infectious smile and laugh. She was such a fun lady!! I bet her and Linnie are keeping all the other angels on their toes with their antics!